“We worship leaders can feel like impostors. How could I "lead" the worship of God? Reveal the Glory of God? Invite the Presence of God? I've been thinking and reading a lot about Jesus as our Great High Priest. He's the worship leader. Not me. It's through Him we access the throne room of heaven. Not me. It's through Him we can be filled with the Spirit. Not me. It's a good thing too because this week I made one of my worst worship leading blunders! We were transitioning from one song in "D" to another. A very worshipful moment. A very "smooth" transition. Without looking at my hands I plucked the first chord. My hand was 1 fret too high. I played a D#! It sounded awful. I recovered as quickly as I could. Praise God moments like these don't destroy our worship. Jesus is working and moving and leading far beyond anything we can see. Distractions like these are nothing to Him. 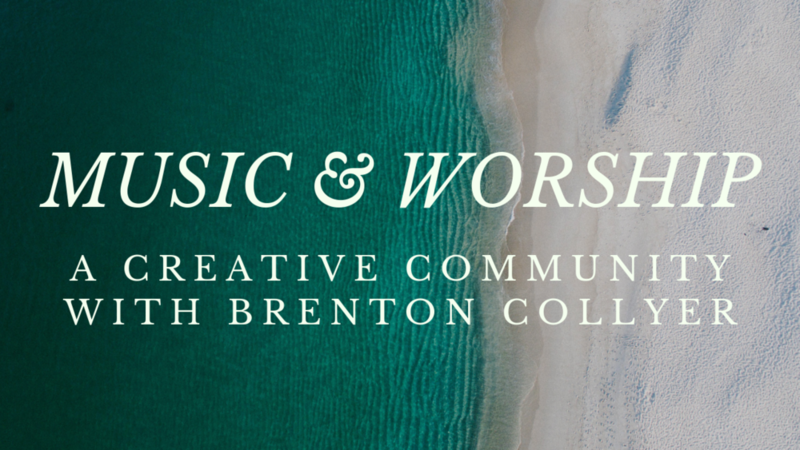 Meaningful worship is not up to us and our distraction-free smoothness. Jesus Himself is forever approaching God the Father on our behalf. Transforming our imperfect praise into pure praise through the power of His blood! The verses of this song look back at the Gospel story. Celebrating what Jesus has done. The Chorus shadows our future hope. Praising God and enjoying Him forever. This is one of my favorite worship songs. Celebrating Jesus as the one who is Exalted Over All. The piano and electric guitar lines are also really tasteful and musical. There are too few songs in the church that are confessional. Taking a moment to admit our failure. To recognize we are prone to wander. There are many songs that declare what we wish to do for the lord. But few that say what we actually do. Being honest and admitting we fall short is so important for the corporate church and the personal believer. We lead an original arrangement of this song. It has an Americana feel to it and is a lot of fun to play. You can hear this arrangement at minute 14:00 of our Live Stream video below. This song has been on my heart and mind for the last few months. I've always loved this song but rarely lead it. A few weeks ago I included a simple arrangement of it for our Tuesday Night Bible Study. It connected powerfully with our church. Our original arrangement of this song keeps the dynamics pretty low. This is an intentional decision to balance the healthy tension between music and lyrics. I've written about that tension in a previous article. You can hear our arrangement of Be Thou My Vision at the 19:05 minute mark of the Live Stream video below. What a wonderful prayer to sing! The vision of my home church is “Jesus Famous”. I love singing this song and praying we'll see Jesus Famous in our life, church, and world. We've done the original arrangement of this song, however, we'll often lead a "short" arrangement we've worked out. To hear this arrangement watch the Live Stream video below beginning at the 22:55 minute mark. I typically read through the pastor's teaching notes before deciding on a song to close the service. I did the same this week and decided on a reprise of "Exalted Over All"
During the teaching at the second service, I felt the song "Tremble" would be a perfect fit to close with. So I texted our team with about 5 minutes to spare. No one had the music, we hadn't rehearsed the song that day. But I was confided it wouldn't be a problem because we have a strong, well-prepared team. This is a testament to the importance of consistent rehearsals, a committed team, and memorizing your music. We were blessed to have a guest teacher this week. Bill Buffington from Calvary Inglewood. It was so good! He taught a message called "Set Free To Serve" from Luke 8:26-39. Here are some quotes from my notes. "Some think that salvation is the finish line. For believers, salvation is just the starting line." "If your life and faith are boring, you're doing it wrong. Want some adventure? Go witness to someone this week." "God makes Himself know where there is a Need"
"Many times the people who need what we have, the truth of the gospel, are the ones to repel us. The ones who look different from us. The ones we want nothing to do with." Click here for a PDF of our service order.